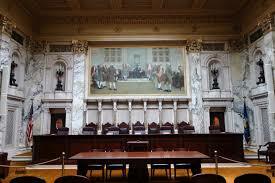 The U.S. Supreme Court announced it would hear arguments on a case involving Wisconsin legislative districts. State Attorney General Brad Schimel appealed the case, Gill v. Whitford, to the Court after a three judge-panel ruled that Wisconsin’s legislative districts qualify as unconstitutional partisan gerrymandering. In November 2016, a three judge panel issued a ruling that the district map was unconstitutional and advantaged Republicans. The ruling marked the first time in three decades a court invalidated an electoral map due to partisan advantage. In January, 2017, the panel ordered district maps to be redrawn by November 1, 2017 to ensure a new map is implemented by the 2018 general elections. State Attorney General Brad Schimel appealed the ruling to the U.S. Supreme Court in February, and on June 19, the Court announced it will hear oral arguments in the fall. The case will be closely watched by judicial and political spectators. The Court’s ruling could have a significant, lasting impact on how electoral maps are drawn throughout the country. The Court has not yet scheduled a specific date to hear the case.